Why not join us in exploring the Cork coast from a different perspective. Coasteering involves jumping from the cliffs into the Wild Atlantic and explore the sea arches, stacks and blowholes. Meet the ocean life in its natural habitat and learn about the flora and fauna of the area. This is the most exciting way to start or finish your trip of the Wild Atlantic Way. Set in magical surrounds with the sea underneath us 15ft off the ground and jumping into the sea!! 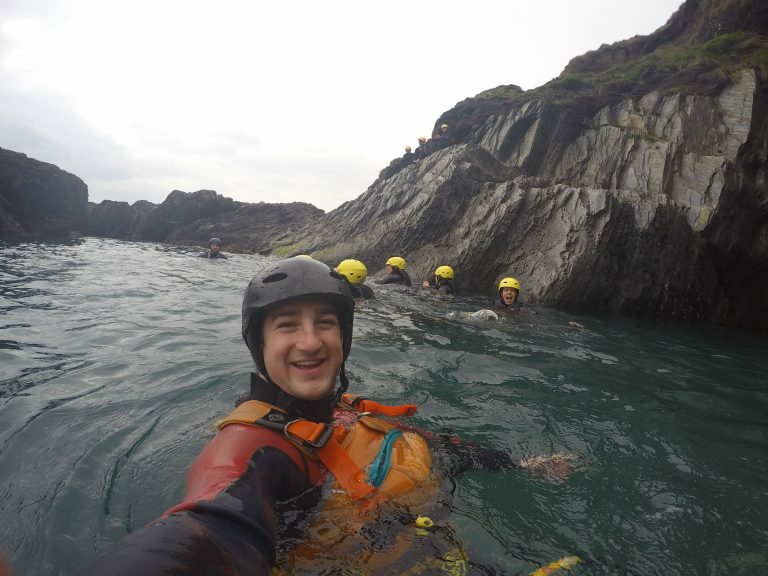 We host coasteering experiences regularly from two of our most popular venues, Howe Strand and also Garretstown Beach, both within close reach of Kinsale, Co. Cork. See the maps below for information about our meeting points. Once you have arranged a booking with us, we will let you know the date, time and venue to meet. For private group bookings please contact us directly to arrange your tour.